The ice cream peddler in his Ottoman-esque costume of golden vest and red fez, teased the customers with the metal pole he used for stirring the Turkish ice cream. The ice cream was so stretchy, it dangled on the pole without falling off, much to the amusement of passersby. He further taunts by offering the cone and grabbing it back, tossing it in the air, inverting the cone just when you think the order is ready. Occasionally, you are party to the drama by getting a lick off the ice cream. We watched in bewilderment, despite having witnessed it nearly everyday of our 5 day stay in Istanbul. On this day though, we had decided to put our affair with the pistachio ice cream with hazelnut aside and find our way to Karaoke gulluoglu, a baklava parlour. As we navigated through the narrow by lanes for a good hour, it was tough not to pull up a chair and sit in any one of the countless baklava shops in the same area. But we resisted for the promise of having the best baklava with the best kaymak (rich Turkish buffalo clotted cream) in town. Once we reached, we realised looking around at other tables that baklava here wasn't just a pastry on go or a dessert to have a slice off. It was to be devoured over golden hued warm tea, over conservation that lasted for hours, with friends that schemed of how is the perfect way to go about a relationship. So despite, having stuffed ourselves with the best kind of freshly grilled mackerel sandwich just outside of the shop, we decided to order one of each type of baklava we could lay eyes on. This wasn't going to be our first encounter with baklava, in fact the dead cloyingly sweet flaky bites have often been too sweet for our palates. Perhaps, that explains why until our last day in Istanbul we hadn't battled our way to having any. As I sat on the high stool with a plate filled with all kinds of baklava - walnut, almond, orange, chocolate, pistachio and a big dollop of rich clotted cream, I remembered our hotel owner's words of wisdom before we set out for the day - dollop some cream in your spoon first and then prick into the centre of the baklava and spoon it all in the mouth. The buttery silky cream melts away cutting into the richness of the baklava. The baklava itself isn't dripping in simple syrup as our previous experiences made us believe. We could clearly hear the crunch as we bite into the upper flaky layers until we reached the lower layers which were sweet and filled with nuttiness. In the end, we were too stuffed to finish all of it but none of the clotted cream remained. This post might be a little too late since the ice cream season has passed but if you ask me, ice cream is for all year round! Specially if it is loaded with earthy pistachio and flaky crispy phyllo with warm drizzle of honey, this in fact might be perfect to eat wrapped up in your cosy blanket even through winter. You could use simple syrup instead of honey for a sweeter version but don't go too heavy on the honey as it overpowers the other flavors. In a cooking demo we attended in Turkey, the chef mentioned that the key to best nut based desserts including baklava is to use fresh crop pistachios. While, I'm not sure how to get that pistachios, I do use fresh and good quality ones for best flavour. 1 1/2 tbsp honey, thinned with 2 tbsp water and few drops of orange blossom water or rose water. Alternatively you could use simple syrup for a sweeter version. Heat butter in a pan and add the pistachios. Lightly roast them until fragrant. Blend the pistachios with sugar and milk until a paste consistency is achieved. Whip the whipping cream to stiff curves. Fold in the pistachio mixture lightly. Pour the mixture in a container such that the ice-cream is at least 1.5 inch in height and three 3inch squares can be achieved when cut into. Freeze for 10 hours or more. Prepare the phyllo by defrosting it in the fridge overnight. Keep a damp cloth handy while making the baklava to prevent drying of the sheets. Butter a 9*6 inch shallow rectangular pan. Trim the phyllo if necessary to fit at the bottom of the pan. Brush it with butter and layer another sheet on top. Butter it. Repeat this until 4 layers are formed. On the top layer sprinkle chopped nuts and spread it out with your fingers. On another work surface butter a phyllo sheet. Put this sheet, buttered side down on the top of the nuts. Lightly brush the top of pastry with butter as well. Cut the sheets into 6 - 3inch squares. Bake in 180C oven for 15 minutes or until golden on top. Drizzle with thinned honey or simple syrup. Let it cool. Remove the ice cream from the freezer and cut it into 3 inch squares. Remove the baklava squares from the pan. Place the ice cream square on top of one baklava and then top it nut side down with another square creating a baklava ice-cream sandwich. Do the same with the rest. Garnish with pistachios. Serve immediately. Thank you Sue! how have you been? This looks absolutely amazing!!!! 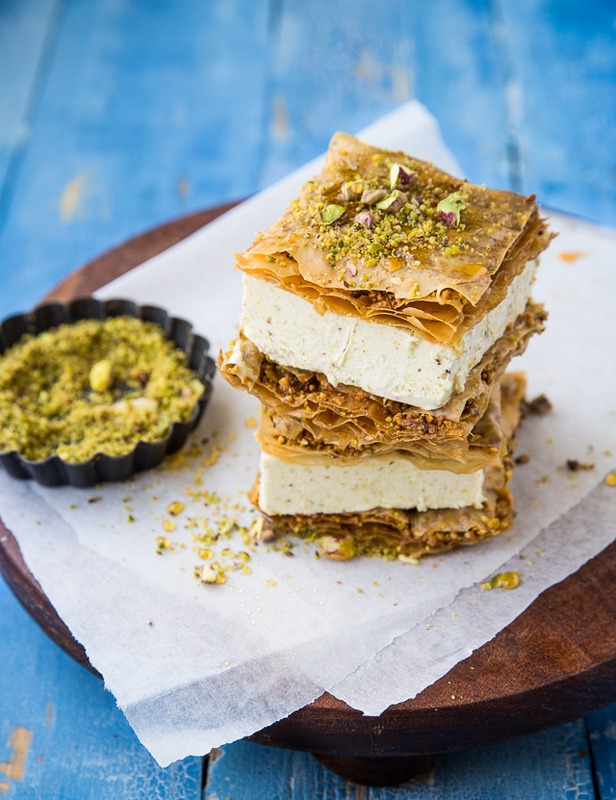 Combining baklava and ice cream is just pure genius! I officially am in LOVE with this! Such a unique ice cream sandwich. OMG! This looks so amazing! Saw this on Foodgawker and just had to Pin! These looks absolutely epic! Love the idea of the flaky pastry and cold ice cream. this looks like a delightful dessert! This is definitely the most pretty ice cream sandwich I ever saw. I never liked ice cream and I want to grab a bite right now!